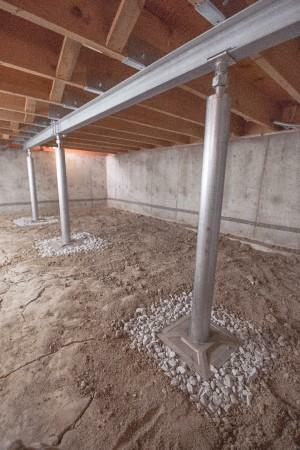 If you have uneven floors over your crawl space or sagging floor joists, crawl space support jacks may be the solution for your home. TerraFirma uses the SmartJack® crawl space support system, which provides solid support for sagging and undersized beams, restoring stability and straightness to sagging floor joists in a crawl space. Our crawl space repair system will ensure that your home has a stable crawl space that won't sink or sag. If you're interested in crawl space support jacks in your home, call us today for at 1-844-311-8051 or click below to get started! We offer free estimates on our crawl space repair services in Portland, Eugene, Medford and nearby areas in Oregon and Washington. If your crawl space is sinking or sagging, TerraFirma is here to help. We eliminate your sagging and uneven floors at the source, giving you a durable solution that restores your home's stability. If you want to put an end to your crawl space repair problems, give us a call today at 1-844-311-8051 or contact us online to get a free estimate on crawl space support jack installation. We provide all our services in Portland, Eugene, Medford, Seattle, Tacoma, Salem, Renton, Hillsboro, Gresham, Roseburg and throughout the surrounding areas.